Packed with the same features as our full-size writing journals, these wonderful, smaller purse or pocket size notebooks are naturals for recording your inspirations spontaneously, or to get notes quickly jotted down! The journal is bound with a quality man-made material with the look and feel of real leather (trade name LuxLeather), has an attached ribbon page marker, a lay-flat spine and an attached elastic band closure to protect your pages. 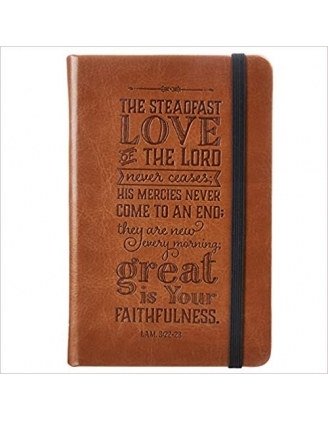 There is a verse from Scripture on each of the creamy, acid-free, lined pages.